One trick that some social media professionals use to puff up the impact of their Facebook efforts is to equate the number of fans on their fan page with the number of people who are exposed to their wall posts. The sleight of hand goes something like this: "We posted four status updates to our 50,000 fans--a reach of 200,000 impressions." Of course, the number of fans who see a brand's wall post is likely far less than the number of people who have "liked" the brand. Implying that every fan sees a wall post is no more accurate than implying every email subscriber receives and opens a message; this is because, just like email, Facebook communications have to pierce a spam filter firewall that protects Facebook users. Facebook doesn't say it has a "spam filter;" instead, it has a "News Feed." As noted in Facebook's Help section, the News Feed "is a constantly updating list of stories from people and Pages that you follow on Facebook." The center column of your Facebook home page isn't a pure stream of posts by friends and brands but a distilled view of the posts and shares you'll find most interesting. 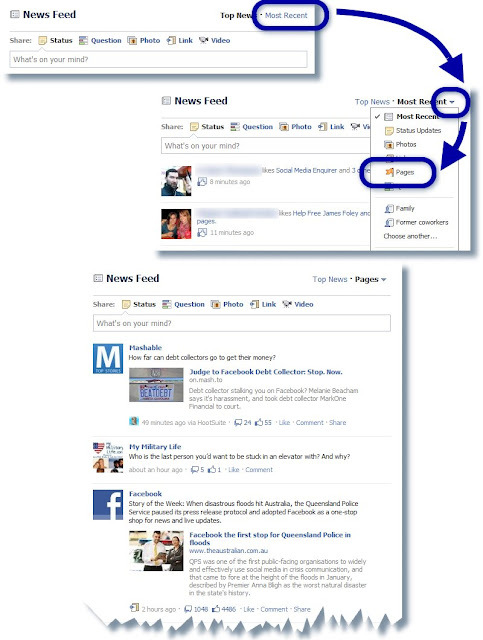 How does Facebook know what's interesting to you? "The News Feed algorithm bases this on a few factors: how many friends are commenting on a certain piece of content, who posted the content, and what type of content it is." Put another way, Facebook knows you don't sign on to the social network to find out what your underarm deodorant or favorite retailer is doing but to interact with the content your friends create and share. Friends' content makes it through the filter; brands' content largely does not. First, sign into Facebook and check out the News Feed on the home page. Review the posts made in the past eight hours and count how many of them come from the fan pages of brands. Since the "Top News" feed isn't in strict chronological order, it is an inexact science to count the posts made in the past eight hours, but you need not be exact to recognize the point being made. Step Two: Click the tiny arrow that appears next to "Most Recent" and select "Pages." Step Three: Count how many wall posts were made by brands in the past eight hours. The number of fans for your page is not the number of fans that will see your content. To maximize your wall posts' visibility, your content strategy has to create action and not just interest. Really interesting post - glad to see you still creating great content in your new job. I wonder what percentage of Facebook users (or "active users" - defining this could get tricky) click on the "most recent" tab regularly when using the site, instead of staying on the "top news" page. Personally, for example, I tend to use the site in the "most recent" view exclusively, but I'm definitely a power user. Usage, in general, would be an interesting topic for a short survey, but I don't know anyone / any company that's done the research yet, Forrester included (my employer). Thanks, Zach. Nice to hear from you! I, also, use Most Recent, but i'll bet the typical user does not. It sounds like a job for a researcher. Know any? Very good point--Facebook offers its own analytics for Facebook page admins. My point--which I should have made clearer--wasn't that admins can't get good data but that we need to consider what it takes to burst through that de facto spam filter. LOL, Augie, - that fox and hen analogy was funny :-) And apt! That is an issue that brands will struggle with.